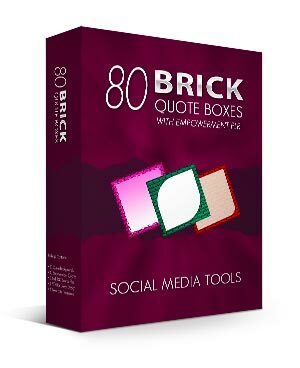 With delivery of this social media package, you get a variety of colorful brick quote boxes with 40 empowerment quotes, measuring 511 x 511 pixels for Facebook and 600 x 600 pixels for Pinterest. Facebook and Pinterest do not share the same empowerment quotes! 40 – Empowerment quotes delivered in TEXT format. 40 – PNG Facebook brick backgrounds. 40 – PNG Pinterest brick backgrounds. 20 – Web-Ready-PNG Facebook bricks with empowerment quotes. 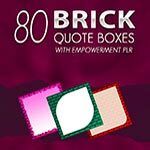 20 – Web-Ready-PNG Pinterest bricks with empowerment quotes. 1 – PowerPoint Facebook brick backgrounds – 511 x 511 pixels. 1 – PowerPoint Facebook brick quotes – 511 x 511 pixels. 1 – PowerPoint Pinterest brick backgrounds – 600 x 600 pixels. 1 – PowerPoint Pinterest brick quotes – 600 x 600 pixels. 1 – Photoshop PSD source file for Facebook backgrounds. 1 – Photoshop PSD source file for Pinterest backgrounds. 1 – Photoshop PSD smart template for box cover. You’ll receive 80 brick backgrounds: 40 sized for Facebook and 40 more sized for Pinterest. Feel free to reuse the brick blank backgrounds to share a variety of social media tips. Unlike our other brandable covers, this one is delivered as a smart template for Photoshop. Open the file in Photoshop (CS6 or higher) and edit the front and side covers. The smart template will automatically update your design in 3D! The Microsoft PowerPoint layout files are included to make it easier for you to recycle the backgrounds and add different quotes than the ones I’ve provided. 1 – PowerPoint Layout: Facebook backgrounds – 511 x 511 pixels. 1 – PowerPoint Layout: Facebook quotes – 511 x 511 pixels. 1 – PowerPoint Layout: Pinterest backgrounds – 600 x 600 pixels. 1 – PowerPoint Layout: Pinterest quotes – 600 x 600 pixels. 1 – Photoshop PSD source file for Facebook brick backgrounds. 1 – Photoshop PSD source file for Pinterest brick backgrounds. 1 – Photoshop PSD smart template for Box Cover..